Over the course of seven weeks two 8th graders, Noah and Jonas, transformed the shop into a 3D puzzle. They built temporary walls and made blueprints detailing the layout of puzzles, keys, and combination codes. 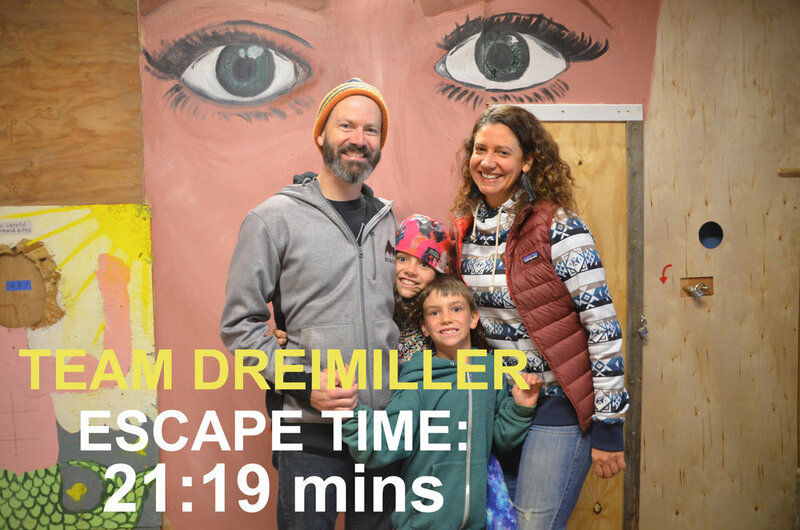 The escape room was open to the public for 10 days from October 27 - November 5, 2017. During that time we hosted 52 groups totaling to 210 people. Teenagers, grandparents with grandchildren, college students and families all participated in this intergenerational game. 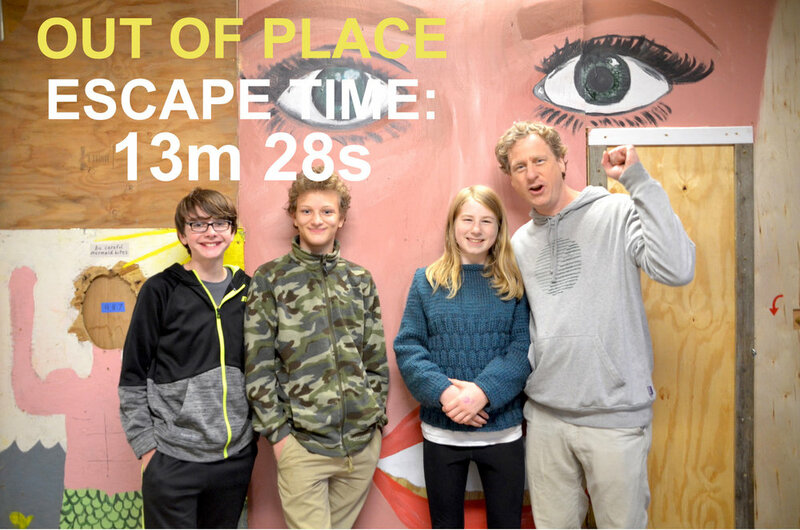 Over the course of 10 days we shared the escape room with 52 groups totaling to 210 people. We started our adventure by rummaging through wood scraps in search of inspiration for puzzles. One of the first items we found were 1"x1" wood cubes. We thought about stacking them or writing letters on them to spell out clues, but we finally settled on marking them with dots to make a variation of the number-placement game sudoku. When all of the blocks are properly aligned and added together they provide a code for a combination lock. Noah marks an angle on a 1x4" board to make a frame for the sudoku board. Notes from our brainstorm session included an idea for a braille puzzle. First session accomplishments: sudoku puzzle, crate with dowel chopstick game, and a PVC pipe mount to hide a key. Once we had a few puzzles completed we started framing walls to create three smaller rooms within our shop. The walls sparked some ideas for how to disperse the puzzles and keys. While we were framing and moving things around, Jonas found a painting on a piece of plywood of a mermaid. It had a hole cut out of it that gave him an idea for a game. It would involve throwing an object through the hole at a target, which, when knocked down, would drop a guillotine-like board with a code for a combination lock. The plywood hanging above the mermaid is suspended by a pulley and counterweight. Noah and Jonas tested a few different items to get the weight just heavy enough. When the counterweight is knocked over, the rope releases and drops a piece of plywood revealing a number code. When the player knocks over the screw box (which is filled with rocks) it falls off of the 2x4's releasing the rope that is sandwiched between. Noah had an idea to make a puzzle that involved reading braille by sticking your hands through a couple of cut-out holes in the wall. We prototyped his idea by cutting a couple of circles out of a piece of plywood and pinning thumbtacks onto a board behind it. The position that the thumbtacks were placed corresponded to a chart hanging on a nearby wall. Reading the tacks in the proper order unlocked a three digit code. Front view of braille puzzle. Hand holes are covered to prevent peeking through to see the thumbtacks. Thumbtacks are pinned down in sequence to reveal a three-digit number code. Players use a key (posted strategically on a nearby wall) to decipher the sequence. Noah spent the whole session tinkering with a mechanism that would release a hidden key by lifting up a spray paint can. After many iterations and a trip to the hardware store he finally got the invention to work using magnets, string and washers. 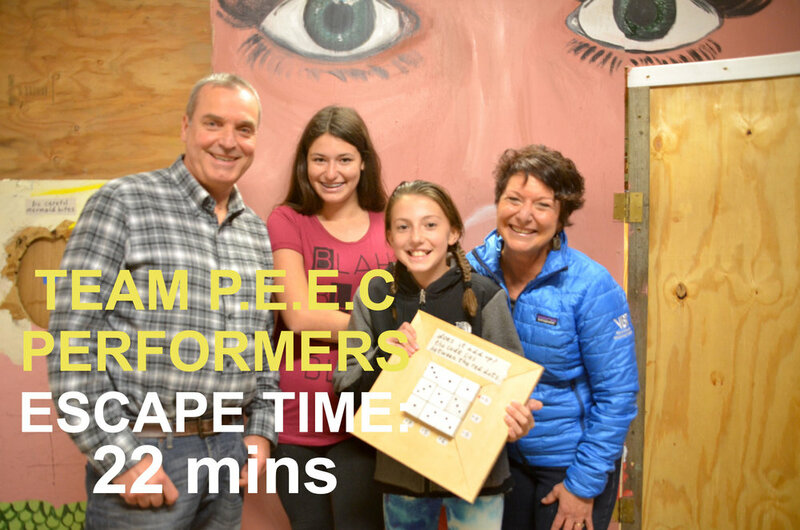 The puzzles in our escape room were placed in a non-linear order. Players had to go back and forth between rooms to unlock clues. To help us keep track of the locks and keys we made a blueprint of the shop floor plan and labeled all of the components in each room. We also temporarily labeled all of our locks and keys to remind us where everything went. Once the map was drawn, Noah and Jonas began working on a new puzzle. They built a square out of 2x4's then cut plywood to cover one side of the frame. Then they proceeded to drill 1/4" holes all over the face of the box. Next to one of the holes the boys hammered in a small nail which would hold a key. This game came to be called the poke game because it required the player to use a dowel to poke through every hole until they managed to hit the right one that would release a hidden key. With almost all of the puzzles in place, it was time to build and install the doors that would separate each room. We used 1/2" plywood and roof strapping to make quick and functional doors that would fit into our wall frames. Once the doors were up we walked through each puzzle adding instructions for the players. We wanted our clues to be helpful and subtle enough to make the players second guess themselves. Our sudoku puzzle was stationed in the second room but the block pieces to complete the puzzle were hidden in a locked box in the first room. Our puzzles required players to keep track of every object they collected and occasionally refer back to a previous room. Jonas's sister Anna stopped by to add some character to our game. She painted a giant face on a piece of 4'x8' plywood in an hour and a half. The only constraints for the painting we asked for was that she make the nostrils line up with the braille hole cut-outs. This way, players needed to reach into the nose to read the puzzle. 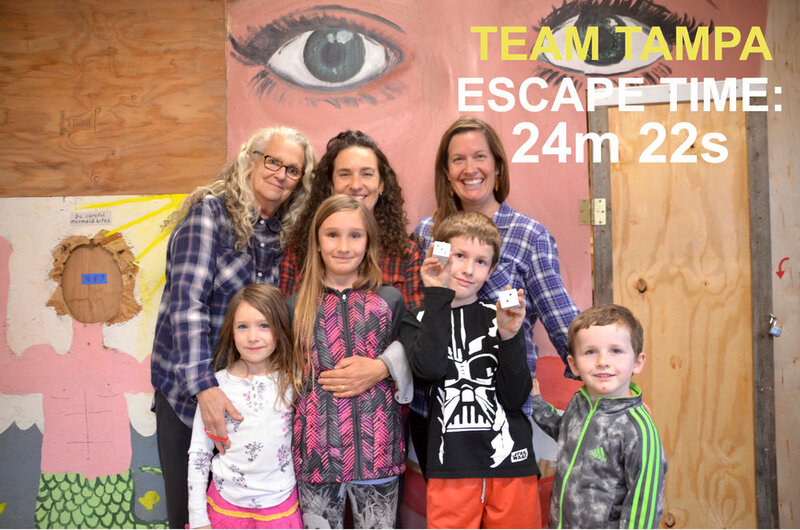 Now that every step was coming to completion it was time to announce our escape room to the public. 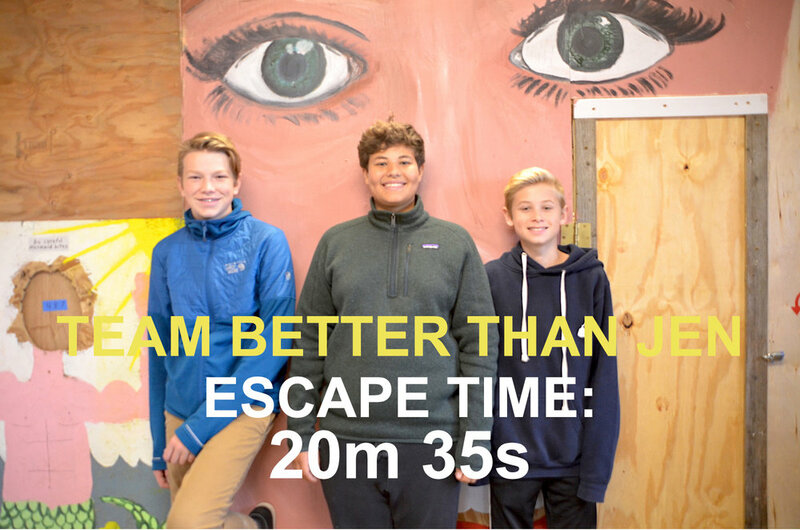 We made this promo video using footage from the making of the escape room over the course of 6 weeks. 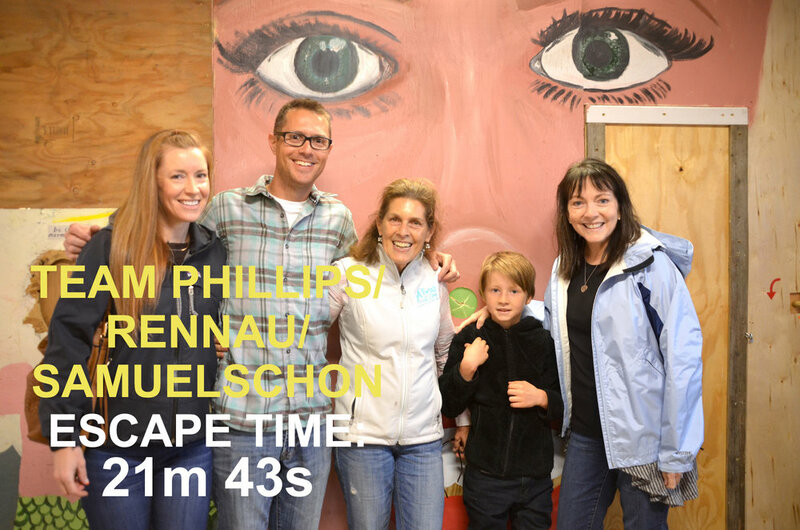 One of the final details added to the escape room was a surveillance and audio amplification feature using a GoPro camera and Noah's phone. We were able to extend an auxiliary cable out a window to provide clues from outside. Players were asked to move the camera with them as they entered a new room and set it on a designated position. 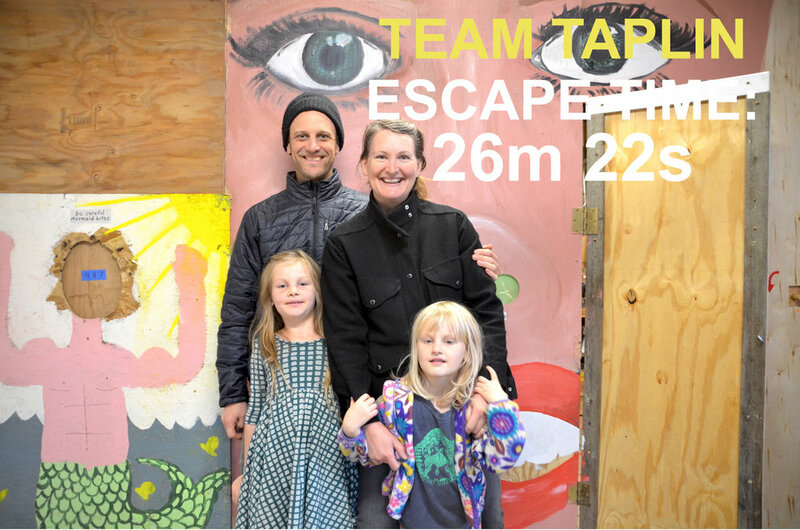 Our friends, Andy, Johno, Kristen and Emma, came up to the shop to be the first trial group. We were pleasantly surprised at how fluid the course worked. 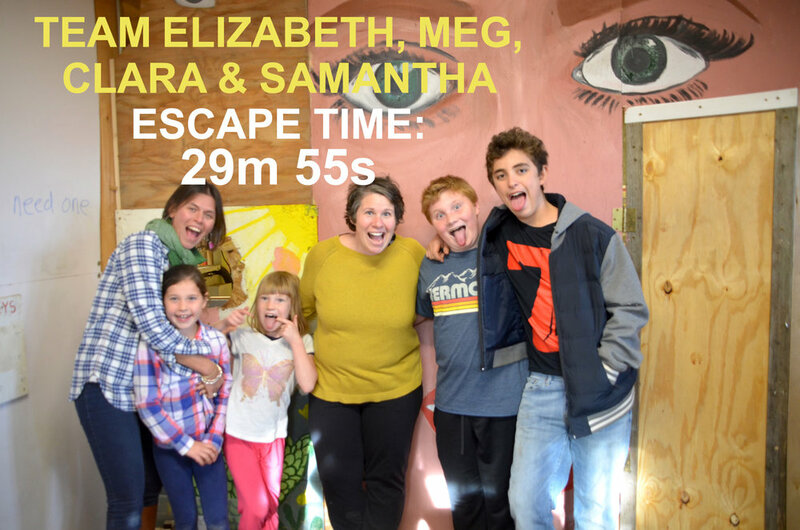 They managed to escape in just over 21 minutes. 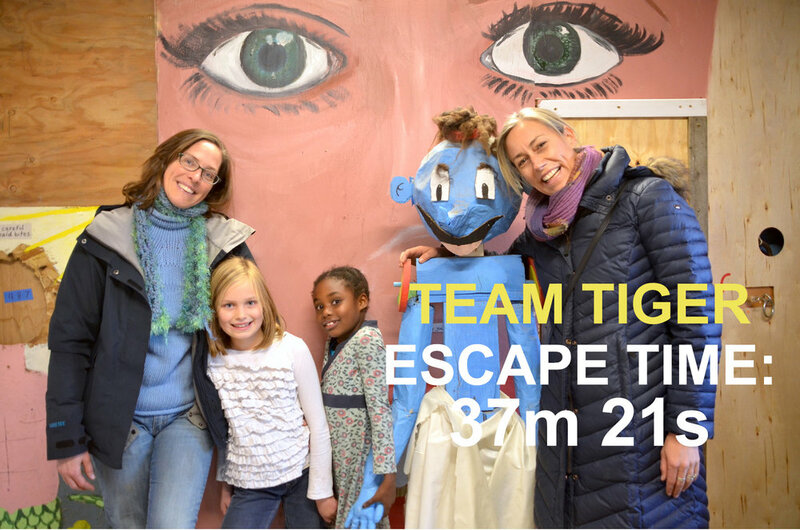 Their run was helpful for us to see where we could add a layer of complexity to make the course slightly more challenging. 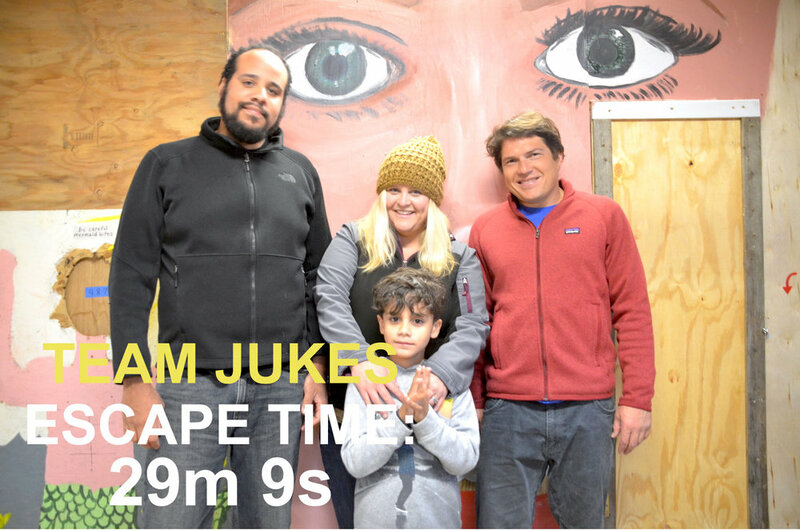 Our goal was for groups to escape within 25-30 minutes. 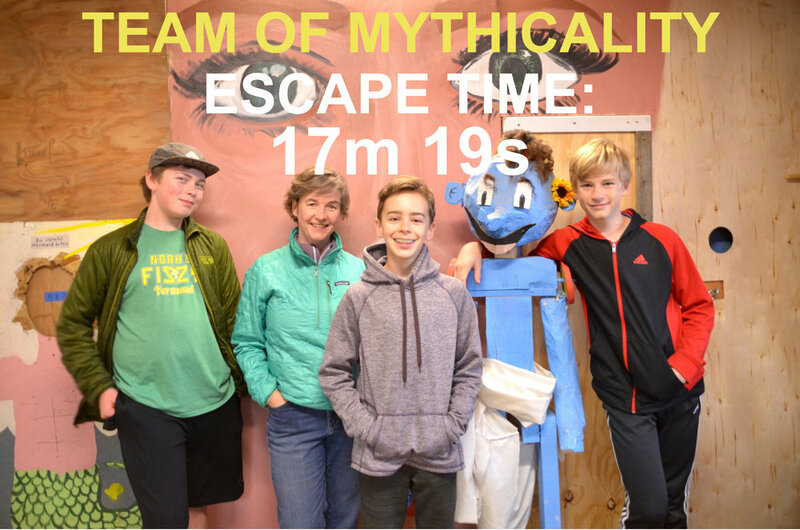 The escape room was open for 10 days from October 27 - November 5, 2017. 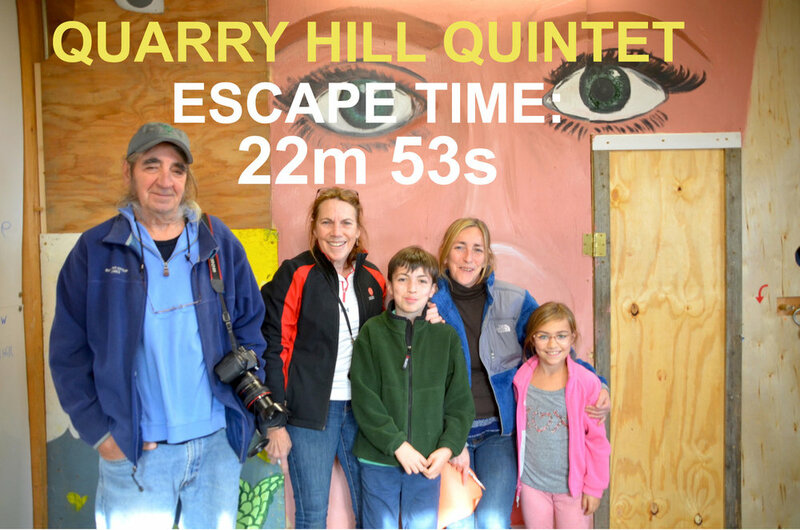 During that time we hosted 52 groups totaling to 210 people from all across Vermont. Families, grandparents with grandchildren, college students and teens all participated in this intergenerational family game. 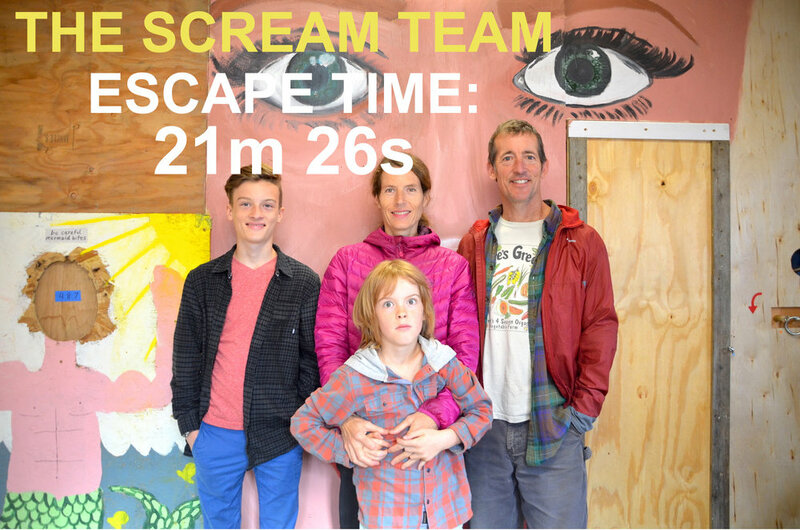 Every group was given 30 minutes to figure out how to escape by solving puzzles and finding keys to unlock doors.